Briefings have been provided to the incoming Minister for Climate Change from both the Ministry for the Environment (domestic) and Ministry of Foreign Affairs and Trade (international). These papers outline the status of current work, as well as priorities and challenges ahead, particularly in meeting our Paris Accord commitments. The briefings can be found here. We hope that 2018 will bring more certainty as to the details and timeframes for proposed changes (particularly around forestry accounting rules), and what impact changes may have on carbon revenue potential. Market commentators got it right when they predicted that $20.00 would be reached prior to Christmas. 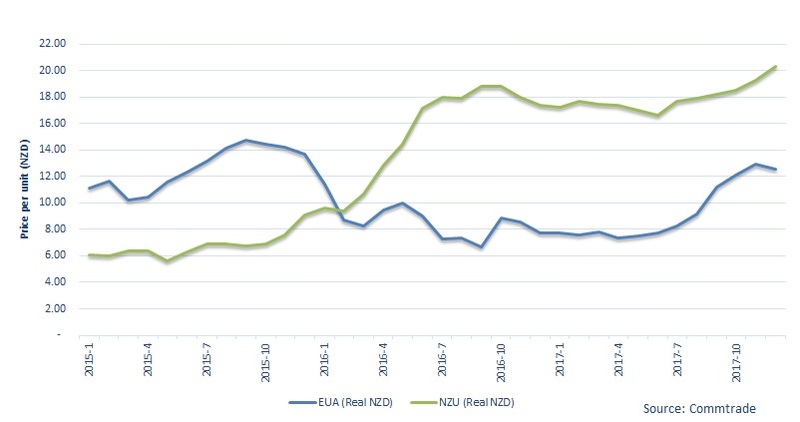 NZU prices rose through this mark earlier in December, and have continued upwards towards $21.00 Current pricing (as at 18th December) is $20.95. Given these near-record high prices, it is somewhat surprising that interest to sell is light. It seems that many forest-owning sellers are prepared to ride this out a little, and see just how far this run will go.